Today Russian River Brewing‘s newest beer is being released, and it’s been some time in the making. 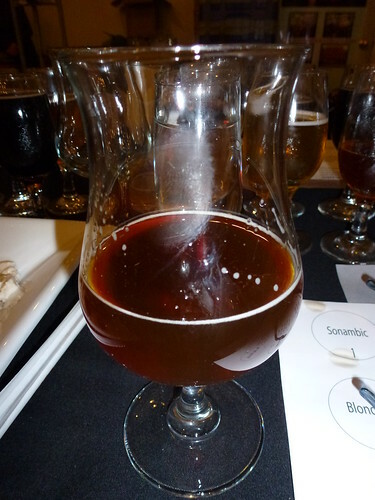 It’s a blended beer made with six beers, only two of which are actual finished beers made before, with the other four being brewed just for blending purposes. Some of the beers had been aging for many months before finally being blended and bottled in April of this year, with additional yeast added to referment in the bottle. The beer, if you haven’t guessed, is the Toronado 25th Anniversary, made for the San Francisco pub’s silver anniversary which takes place next week, though the celebrating has already begun. Tuesday night there was an intimate beer dinner in the back room of the Toronado, to introduce the new beer for their 25th anniversary, which was called the “Toronado 25th Anniversary Dinner and Blending Session.” Homebrew Chef Sean Paxton did the food but was told he could only use one plate. In typical crazy Paxton bizarro world, he did exactly as he was told, but found the biggest plate any one of us had ever seen. 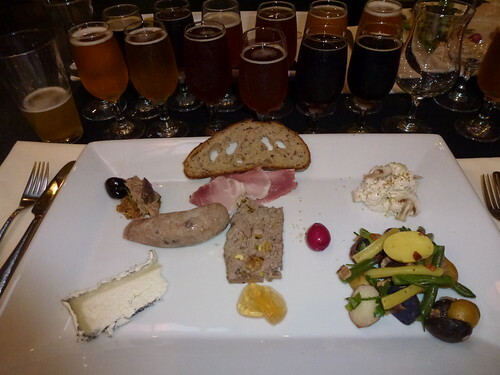 The ginormous plate of many foods was paired with all six of the base beers used to create the beer. Known as “The Plate,” it included 547 Pate (Willie Bird turkey thighs, Liberty Duck — breasts, hearts, livers — and Sonoma County pork, marinated in Toronado 25th Anniversary, mixed with bay leaves, cloves, cinnamon, thyme and pistachios), Haight Street Sausage (Sonoma County pork — shoulder, jowl and belly meat — cold smoked in Russian River Consecration barrel staves and mixed with currants soaked in Toronado 20th Anniversary, caramelized shallots and lemon thyme), Egg Head Customers (quail eggs pickled in malt vinegar infused with coriander, bay leaves, chilies and salt with red beets and sugar, garnished with a mushroom flaked sale), Fungi Dave (Petaluma chicken sous vide in Russian River Beatification, chopped and mixed with fennel, candied lemon peel and a Beatification aioli with paper thin mushroom slices, garnished with fennel pollen and truffle salt), Duck Duck Canapé (Liberty Duck confit in Toronado 25th Anniversary, made into rillettes infused with dried sour cherries topped with confit duck hearts on a hemp chia and sesame seed cracker), Riff Riff Salad (Mixed marble potatoes, green bean, yellow wax bean, apple smoked bacon and hydroponic watercress salad tossed with a Beatification funkigrette), Bejkr Bread, Humboldt Fog Goat Cheese, Beatification Jelly, Fatted Calf European-style Ham, and a slice of ripe melon. 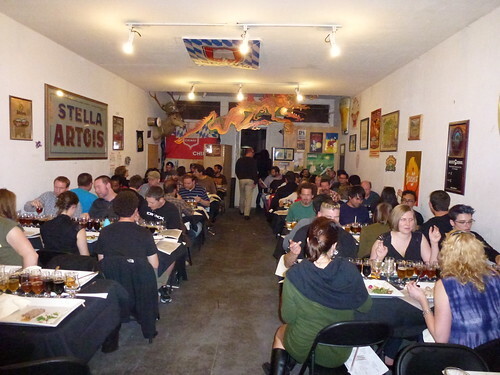 Around 60-70 people in the back room of the Toronado for the Toronado 25th Anniversary Dinner and Blending Session. 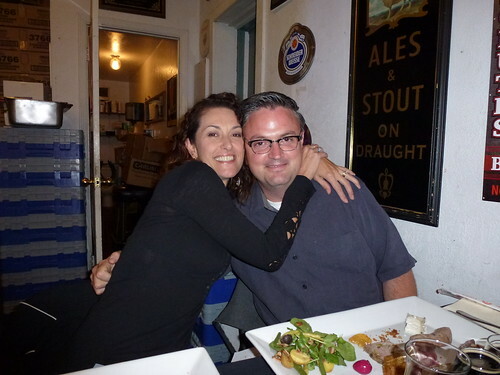 I was fortunate enough to be seated at the table with my friend (and Washoes partner), Toronado owner Dave Keene, along with …. Natalie and Vinnie Cilurzo from Russian River Brewing. 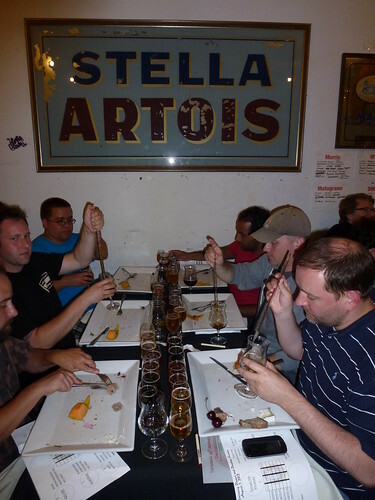 Each table setting included a pipette and an empty tulip glass so that everyone could use the six base beers to blend their own beer. 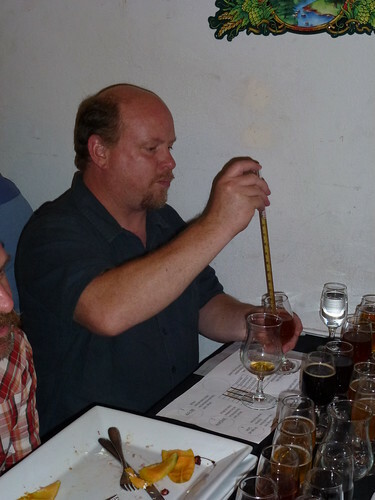 Arne Johnson, from Marin Brewing, working on his own blend. 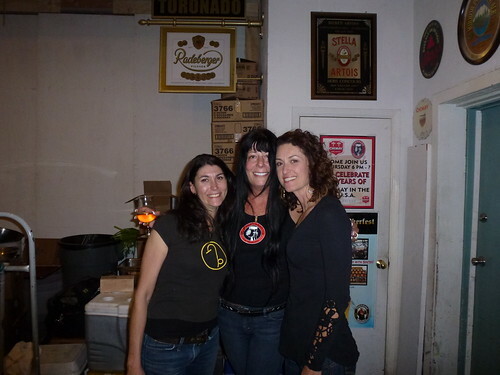 Jen Garris, from Pi Bar, Dave’s wife Jen Smith, and Natalie Cilurzo. 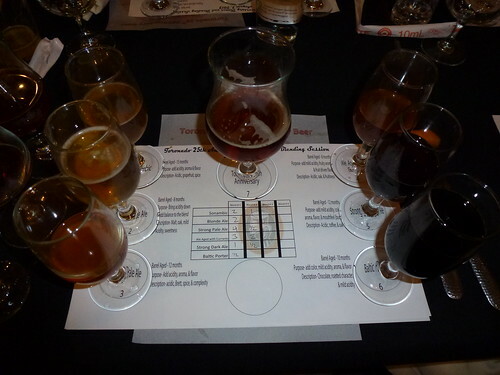 All six base beers with the finished product in the middle, the Toronado 25th Anniversary. If you look closely in the center, you can see the proportions for my two attempts at blending my own beers. Both of them turned out pretty well, with the second being more sour than the first (which was what I was going for). 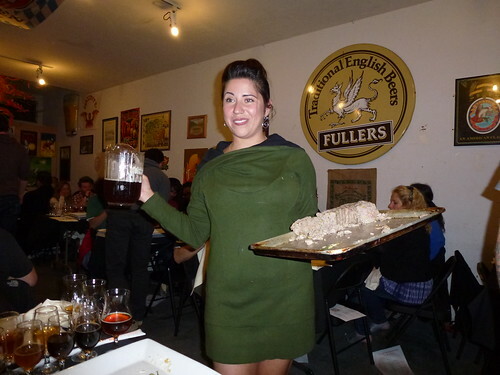 There was also extra pate and the Toronado 25th Anniversary along with a taste of the Toronado 20th Anniversary beer, too. 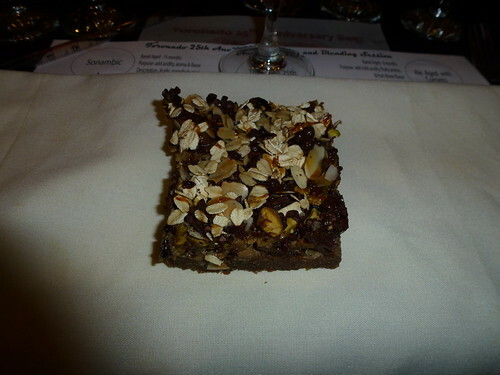 Sean slipped in a second plate, with a dessert on it, a Toronado ‘Bar’ Cookie (a dark chocolate brownie topped with grafitti composed of oats, pistachios, dried cherries and ribbons of malt syrup). 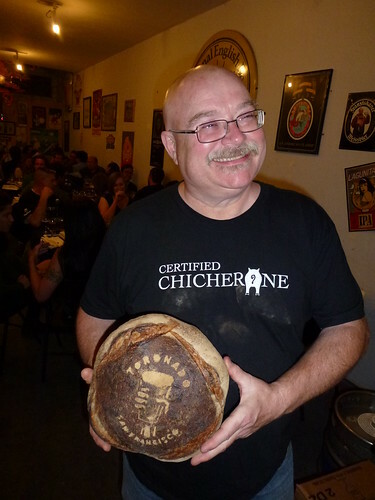 Dave Keene showing off the special bread Sean Paxton made for him. 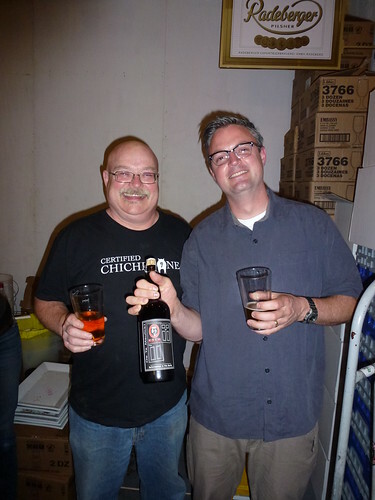 Dave Keene and Vinnie Cilurzo at the end of a great evening, holding a bottle of the Toronado 25th Anniversary. 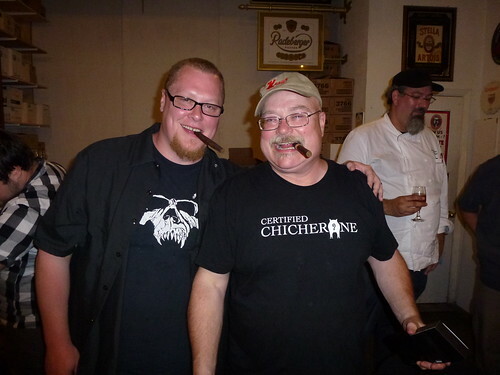 After which, the stogies came out and the evening began, with Matt Bonney, from Brouwers in Seattle, and Dave Keene getting things started. Thanks Dave, Jen, Sean, Vinnie and Natalie for spectacular evening. As of today, the new beer is available for sale. Pick up some as soon as you can, because when it’s gone, it’s gone. There’s more details on the Russian River Blog on how to get a bottle of your very own. Basically it’s $25 per bottle with a limit of two bottles per day, and it’s very limited. But stop by Russian River’s brewpub tonight for a taste of it on draft. Great post! Made it up to Russian River and also to Toronado to get my fill of 25th Anniversary, so amazing! 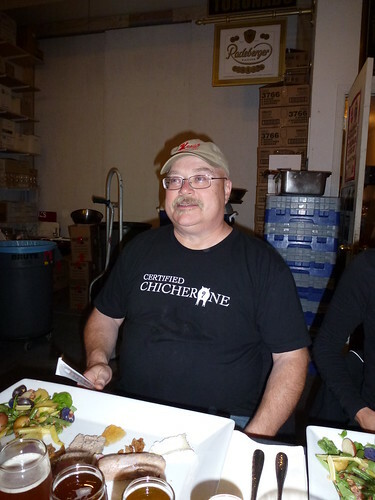 Question…you know where Dave’s ‘Certified Chicherone’ T Shirt is from? It’s FANTASTIC! My email is nelizabethm@gmail if you have any insight on the T Shirt.